Its tilt seems to defy gravity – you wonder why it doesn't topple. Some experts predict an any-year-now collapse. Others believe that the current restoration project will save this world wonder. From 1990 to 2004, the internal steps of Leaning Tower of Pisa were closed to the public, out of concern for both structure and visitors. You can now climb the 294-step spiral staircase to the belfry - as a millions of people have done. The tilting of the structure is not new. Soon after this 800-year-old campanile (free-standing bell tower) was begun, workers noticed a risky inclination caused by soft subsoil. Partial remedies were applied and the architecturally flawed tower was completed about 70 years later. 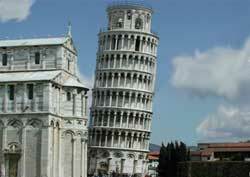 The tilt angle of the 56-meter (182-feet) tall Leaning Tower of Pisa continued to increase. The top edge lists about 5 meters (16 feet) from the perpendicular, creating a gravity-defying appearance. Even if the Leaning Tower of Pisa in Italy didn't lean, visitors would come to marvel at its design (look at the photograph and imagine the tower upright). And, the tower is part of a magnificent Romanesque architectural complex that includes the famous Baptistry and Cathedral of Pisa.